New Delhi, India – Nov 25, 2015 – Cityzenith, a leading Smart City data platform provider, is teaming up with GlobalLogic to implement its next-generation 5D Internet of Things platform for Smart Cities in India. Cityzenith is a U.S. software company based in Chicago that helps global organizations — from government departments to commercial enterprises — make sense of urban data, big and small. Over the past year, ten leading smart cities across eight countries have adopted Cityzenith’s 5D Smart City™ platform, including Barcelona, Amsterdam, Chicago, San Francisco, London, Washington D.C., Dubai, and Singapore. As Cityzenith’s product engineering and delivery partner, GlobalLogic will help the company develop customised smart city solutions that address the Indian Smart City market’s unique needs. 5D Smart City™ helps cities connect, visualize, and manage their data, leveraging a next-generation interactive, intuitive, and real-time 3D simulation that anyone — from the mayor to an engineer in the field — can easily use. Users can point, click, tap, and swipe their way to the information they need in real-time with little or no training. Lightweight and flexible to suit any browser, the platform is designed to be open, non-proprietary, affordable, and works on standard PCs and tablets. 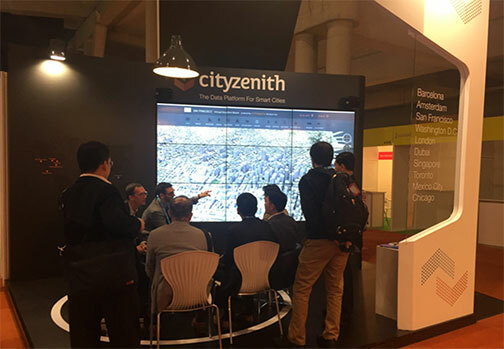 Cityzenith recently unveiled the 5D Smart City™ version 3.0 to more than 10,000 attendees at the Smart City Expo World Congress in Barcelona between November 17-19. The event also had many Ministers of major Indian cities attend the conference and the launch. The partnership between GlobalLogic and Cityzenith will provide the two companies all the skills, talents, and know-how necessary to deliver Cityzenith’s platform technology to all 100 cities earmarked for Smart City development by the Modi administration. GlobalLogic is a full-lifecycle product development services leader that combines deep domain expertise and cross-industry experience to connect makers with markets worldwide. Using insight gained from working on innovative products and disruptive technologies, we collaborate with customers to show them how strategic research and development can become a tool for managing their future. Headquartered in the United States, GlobalLogic operates design and engineering centers around the world, extending the benefits of its authentic global presence to customers in digital media, electronics, healthcare, infrastructure, finance, retail, and telecom industries. The company works with both start-ups and industry leaders, including many of the world’s top hardware, software, and consumer brands. GlobalLogic is a trademark of GlobalLogic. All other brands, products or service names are or may be trademarks or service marks of their respective owners.